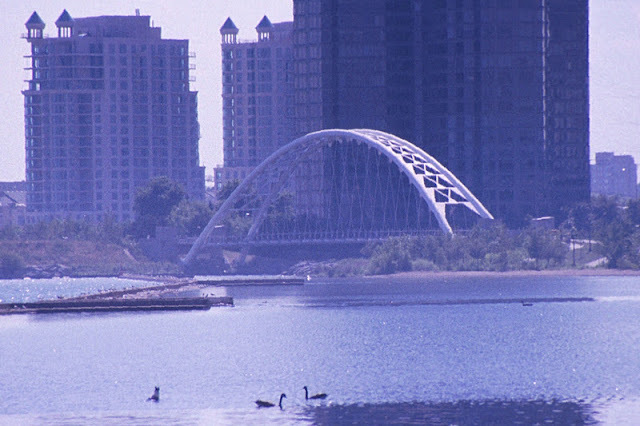 The Humber Bay Bridge is a basket-handle suspended-deck arch crossing the mouth of the Humber River in Toronto. The main span is 330 ft (100 m) long and the arch rises 70 ft (21.3 m) above the deck. It was designed by Montgomery and Sisam Architects and Delcan Corporation Structural Engineers. Construction was completed in 1994. The deck has a prestressed central spine like a bowstring to hold onto the ends of the arch. The bridge was built on land and then moved by barge and cranes into position across the Humber River. The bridge allows pedestrians and bicyclists to travel along what was an aboriginal trail beside Lake Ontario. The bridge includes Native American symbols such as the thunderbird motif in the arch cross-bracing. More information about this bridge can be obtained at the Waterloo Website. Toronto's Bridges: Humber Bay Arch Bridge by Mark Yashinsky is licensed under a Creative Commons Attribution 3.0 United States License.